Item Number: 111-4016-3 18571 Actual Weight: 1.5 lbs. Perfect for general purpose mounting needs. Can be applied to a variety of surfaces. Foam tape fills gaps on irregular surfaces, distributes stress, seals, cushions, dampens vibrations and resists impact. 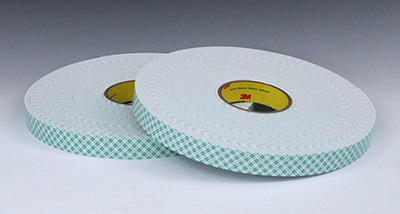 Ideal for indoor applications or for exterior applications where the tape will be protected from the environment. Can handle temperatures to 220ºF. 3M 4016 Double Sided Foam Tape is ideal for light- to medium-duty, indoor use for mounting banners and posters.